Looking at works of art gets us thinking, producing reactions of approval, disinterest or dissatisfaction. Such reactions appear instantaneous. Thereafter, one can move on or get involved. Further pondering, or ‘rumination’, might result in seeing a different painting, print or sculpture etc. Time is key. In the quotation extracted from John Hoyland’s catalogue statement (above), the active and eventful meditation alluded to, fuses emotion (that which is ‘felt’ and ‘enjoyed’) with a visually stimulated encounter (via the ‘senses’). Paintings and other art forms are empowered by being perceived by the viewer. To “see through the eye”, rather than with the mind, is a statement affirming a visual poetics that has a particular, though not exclusive, relationship to abstract painting. Conceptually, and ironically, it establishes an anti-conceptual position. Katrina Blannin, ‘Blue Madonna’, 2016, acrylic on flax, 30x30cm. Like all first-rate researchers, I checked on Wikipedia and read that the term ‘rumination’ has a passive aspect and may reveal a compulsive and repetitive frame of mind. I have to admit that I thought the term was more active, with thoughts taking one on a reflective journey that could accommodate doubt and unknowing as much as certainty and ignorance; albeit with speculation, surprise, questioning, revelation and summarizing all jostling for position. In other words: thought as a creative act. Undoubtedly there are both positive and negative modes of ruminating. Perhaps meditation would be a better term – but meditation per se suggests an emptying of the mind. The unconstructive aspect of ‘rumination’ sounds self-defeating and, I assume, engages in circular reasoning at best. But the affirmative mode of reflection holds creative possibilities that might be realised if one perseveres with the material to hand. For example, in looking at abstract, non-narrative, non-figurative imagery: especially paintings. Returning to Hoyland’s comment, he appears to be speaking on behalf of the viewer as well as himself. However, purely from an artist’s point of view, Gerhard Richter offers an intriguing insight when he says, “Painting has nothing to do with thinking, because in painting thinking is painting. Thinking is language – record-keeping – and has to take place before and after. Einstein did not think when he was calculating: he calculated – producing the next equation in reaction to the one that went before – just as in painting one form is a response to another, and so on.” (From the film ‘Gerhard Richter Painting’, 2011). In some forms of abstract art at least, an aspect of open-ended, non-linear thinking is crucial in the making, or process, of production for many painters – but not all. A visual form of enquiry can, of course, involve mathematical planning and consciously ‘conceptualising’. Having looked so much at Hoyland’s work over the past couple of months, especially with the ‘Power Stations’ show (and in re-reading Mel Gooding’s essential monograph, plus several catalogues from this and previous shows) I took a look at the more overtly geometric aspect of abstract painting by visiting ‘Annodam’, a solo show from Katrina Blannin at Jessica Carlisle. 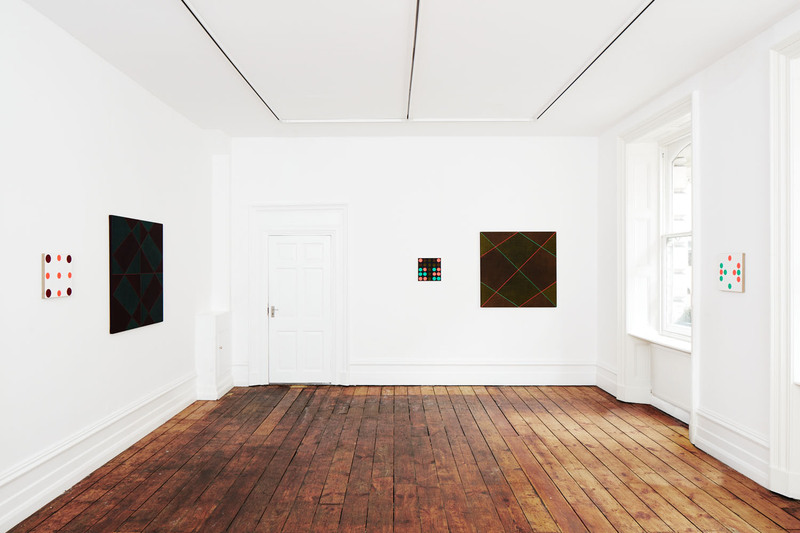 Jessica Carlisle’s new gallery opened recently with an exhibition displaying a dozen or so of Katrina Blannin’s abstract/geometric paintings. The majority of the works were quite small, measuring 30X30cm, with three others at 100cm squared. 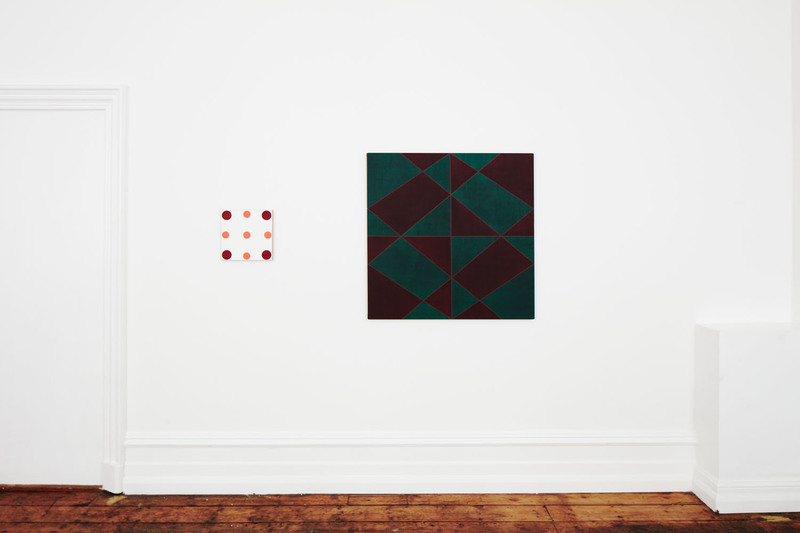 All of the works are given ample space between them, despite the limitations of one room that has a domestic sense of size and scale about it. However, a modern, voluminous ‘white cube’ environment would have visually engulfed these works. So, even with the obligatory white walls, the hang invited intimate contemplation of each painting and, by extrapolation, mental space for rumination as active meditation. I reference the ruminative aspect here because, despite the presence of a packed house at the private view, where space was tight and the atmosphere was one of high spirits, I found myself attracted by a silent, meditative kind of engagement with the paintings: most especially the smaller ‘Blue Madonna’ (30X30cm), that calmly but insistently held my attention. This typical first engagement with an exhibition, where all too frequently there is hurried and inadequate engagement with the art, and a disproportionate amount of time given to social chit-chat, hardly encouraged a fair viewing of the work as I eased around the throng. But, contrarily, I found that engagement with ‘Blue Madonna’ was unfazed by the party-like atmosphere and, rather like the attractive girl (or boy) at the party whom you first set eyes upon, you cannot avert your gaze. Even a quick hello to Trevor Sutton and Carol Robertson, two of London’s most interesting abstract-painting practitioners, did not distract me from my task. Task? Hardly a chore, per se, but a pleasure. And the nature of this gratification? Pick any from: uplifting, elevating and inspirational, visually intoxicating, nourishing, blissful or calming. But none of these terms will quite do. It was all and more. It’s difficult to pinpoint or summarize. Can I, dare I, propose an aesthetic experience, without sounding oddball? Rationality and image ‘deconstruction’ has moved on, surely? Nor was I was privy to something deep and profound that only a specialist audience might be enabled to experience, despite the cultural context of an art gallery. But, the ‘aesthetic’, is a culturally loaded term. The phrase might refer to having ‘good taste’, or an ‘educated’ visual palate. These definitions are uncomfortable and implicitly hierarchical in cultural terms, but I suspect that the purely visual, affective, impression is as dominant as any other reading of an image (e.g. forefronting symbolic, narrative, theoretical or technological imperatives). If I were to assume that we would share the same engaging response I can only gauge this by saying, “go and see it for yourself” and then engage in discussion. There’s no guarantee we would agree, of course. Some might find geometric abstraction dull, too inorganic, or empty of expressive content. But expression, like body language, is communicative as much by still poses as in gestures. What was the explanation for this particular uplifting experience? Certainly there are contextual frameworks. This could include personal mood, which is ephemeral; or fashion (as in what’s ‘in’ or ‘out’), which is best avoided. Then there are personal histories shared by generations: for example, from an extensive art and design education. Educational contexts mold and influence us, even if we have to purposely react against them, for better or worse. The second art historical textbook I read at Shrewsbury School of Art in the 1970s (the first was E.H. Gombrich’s ‘Story of Art’) was Clive Bell’s ‘Art’ (1914), in which he proposes ‘significant form’ as a quality of objects (especially paintings) that rouse our aesthetic emotions. This was probably in conjunction with reading Roger Fry to introduce our specialist fine art group (this was a pre-degree Foundation Studies art course) to Modernism and notions of the avant-garde. Not bad, considering our main studio tutor, Anthony Vettise, was also an art historian with an interest in the Early Renaissance. Does this formative exposure to art history and theory act as my rose tinted art-spectacles? Maybe. As an active viewer (a word that sounds more reciprocal than ‘observer’) there is an opportunity to both access already acquired art historical knowledge, but with the promise of more, of the unexpected, by adding personal analysis. This interpretive paradigm can result in an affective state that eschews a clearly rational, word-bound, explanation or exegesis. The ‘authorship’ of the work transfers to the viewer – the artist must ‘let go’. The proviso that the viewer contributes his or her own interpretation is a relatively modern concept and the belief that the artist is offering an experience highly dependent on the viewer making an effort to engage, with eye and mind, has a democratic implication. The ‘space’ where the viewer meets the painting is therefore both political and physical. The viewer completes the triangulation of artist/artwork/observer. Can we believe that Abstract art, developing from Post-Impressionism, appears ideal for this potentially classless and uncensored role for painting? It’s a purist notion. 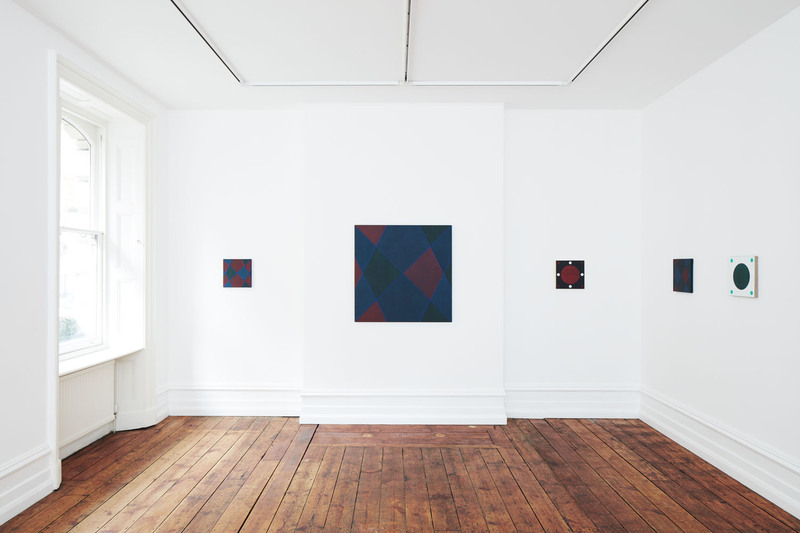 The title of the show, ‘Annodam’, spells Madonna reversed, and gives prominence to four particular canvases: ‘Blue Madonna’ (two versions), ‘Red Madonna’ and ‘Green Madonna’ (all 2016). Whether the viewer is Christian or not, the Madonna image, as a kind of universal Mother Goddess, will possess human relevance. The Madonna of Christianity has various roles to play in the history of European iconography – most especially in painting. If we take Blannin’s pre-disposition towards geometry and a sense of the abstract, metaphysical aura, of form and colour, then add the Madonna into the mix, it is, perhaps, no surprise that Blannin has transposed and transformed the visual essence of a Piero della Francesca fresco (specifically his, ‘Madonna del Parto’ c.1455-60) into a Constructivist-type, systematic composition. The visual scaffolding or architecture, in a controlled colour scheme, appears to echo Piero’s original in Blannin’s various ‘Madonnas’. 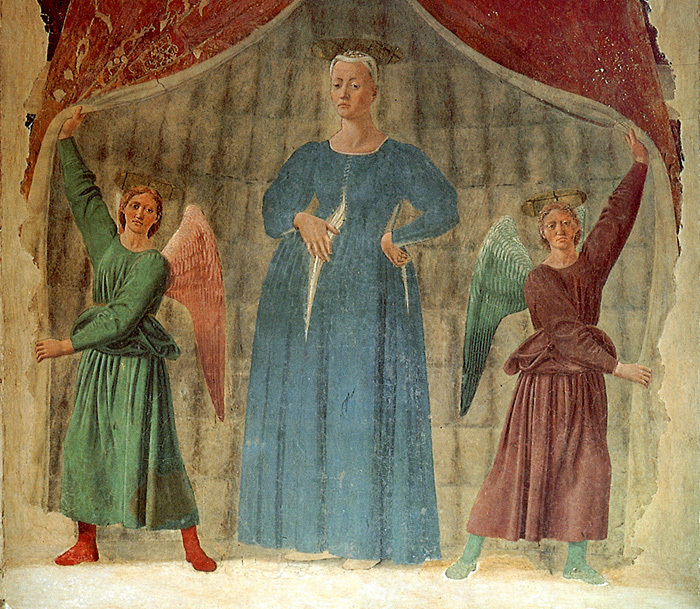 Piero della Francesca, ‘Madonna del Parto’ (after 1457), detached fresco, Museo della Madonna del Parto, Monterchi, Tuscany. But knowing of the original by this Italian Master is not crucial to the ‘affect’ of these paintings by Blannin. However, this small series makes the point that referencing the past is still of interest to painters and those from other fields of the visual arts – Caro’s extended interest in Duccio providing a good example. Would thoughts and reactions be different if we did not know about Piero’s Madonna in considering Blannin’s ‘Madonnas’? I think that we need to, even if it was realised after attending the show, when images, especially good ones, linger in the memory. And we ought to, for an expanded experience, because the curated exhibition is always a conceptual event and the parts include ideas as well as paintings. But the bottom line of experience must be the physical paintings, even with an aura of mystery: metaphysical, spiritual or aesthetic. Blannin’s images presented in ‘Annodam’, physically and visually, constituted by a support, flax and paint, are paramount to authentic, non-simulated and concrete, image realisations. An antidote to the hyperreal. All exhibition photographs provided by Jessica Carlisle Gallery, with thanks. Wonderful essay prompted by Katrina Blannin exhibition. Such a contrast of clarity and erudition compared to the convoluted artist infighting and linguistics often engaged in by the Brancaster Chronicles. I think you would be pretty hard-pressed to find too many examples of “convoluted artist infighting and linguistics”; on the contrary, because the discussions are open and off-the-cuff, all the language is straightforward, if occasionally imprecise, and the latter is only because people are striving to spontaneously find the right words, trying to work out what they feel and think about what is in front of them, shooting from the hip, as it were, and then perhaps trying to tease out from there how certain recurrent issues in abstract art might be taken forward. The whole thing is remarkable for its spirit of cooperation, encouragement, and freedom from infighting. But, as I say, each to his own. I think it’s the best thing around. As for Geoff’s essay, it may well display clarity and erudition, and in that instance will indeed contrast strongly with Brancaster, since in our experience making and talking about abstract art is by no means clear-cut, nor is it a subject anyone knows all the answers to; and if they think they do, they’re playing a game of connoisseurship. In Geoff’s essay we are skimmed across the surface of what is in any case pretty insubstantial work. I have often before explained my reasons for a dislike of abstraction that justifies its geometry by citing figurative precedents. I won’t restate those here; merely to say that if you are going to make minimalist (with a small ’m’) painting, you should have the courage of your convictions and free it up from that kind of baggage. Once you do that, of course, then it is vulnerable to criticism for its banality, like all Minimal (with a big ‘M’) art. I can’t, in any case, really see much of a link with the Piero della Francesca, even if I wanted one (symmetry, perhaps? But that’s a bit vague). 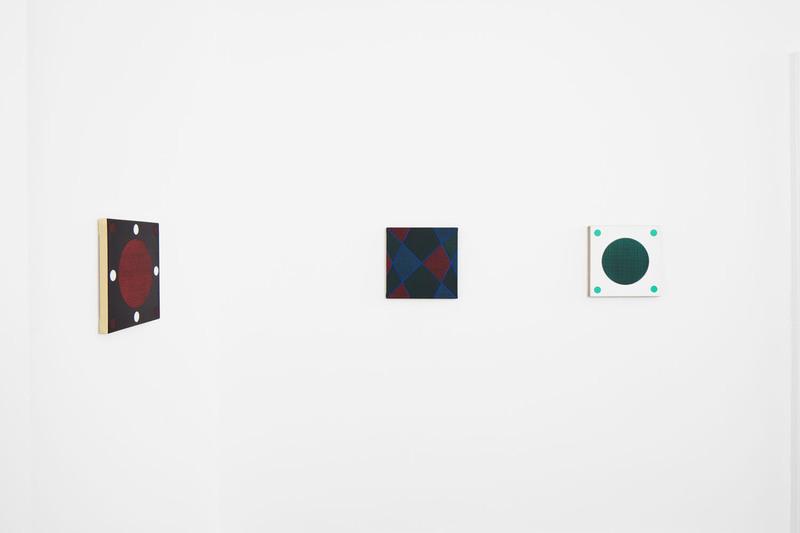 These paintings look to me like content-free objects of desire, with a near perfect materiality (click twice on the ‘Blue Madonna’ image for an up-close view of the surface); a triumph of MOR modernist aesthetics. If that is what you are after, end of story. That’s what they said about Karen Carpenter and now they think she’s a genius! The Blue Madonna picture reminds me of rubber ice cube makers inasmuch as the geometric trickery attempts to almost ‘pop the vision’ out of the canvas, as if two big virtual thumbs were behind it. He has clearly considered the whole show (whereas I was more concentrated on one painting). This reminded me that it’s always worth returning to a show – especially if the crowds have dwindled after the PV. Was that a ‘thumbs up’ from Peter Stott?